Barack Obama’s big government policies continue to fail. He should put a link to the national debt clock on his BlackBerry. The gears on that clock have nearly exploded during his administration. Yesterday’s terrible job numbers should not be a surprise because it all goes back to our debt. Our dangerously unsustainable debt is wiping out our jobs, crippling our economic growth, and jeopardizing our position in the global economy as the leader of the free world. As a governor, I had to deal with facts, even unpleasant ones. I dealt with the world as it is, not as I wished it to be. The “elite” political class in this country with their heads in the sand had better face some unpleasant facts about the world as it is. They’ve run out of money and no amount of accounting gimmicks or happy talk will change this reality. Those of us who live in the real world could see this day coming. Back in January 2009, as governor of Alaska, I announced: “We also have to be mindful about the effect of the stimulus package on the national debt and the future economic health of the country. We won’t achieve long-term stability if we continue borrowing massive sums from foreign countries and remain dependent on foreign sources of oil and gas.” Then I urged President Obama to veto the stimulus bill because it was loaded with absolutely useless pork and unfunded mandates. Everyone knows my early and vocal opposition to that mother of all unfunded mandates known as Obamacare starting back in August 2009, and many recall my objections to the Federal Reserves’ inflationary games with our currency known as QE2 from November 2010. It’s a matter of public record that I did not go to Harvard Law School, but I can add. The same “experts” who got us into this mess are now telling us that the only way out of our debt crisis is to “increase revenue,” but not by creating more jobs and therefore a larger tax base; no, they want to “increase revenue” by raising taxes on job creators who are taxed enough already! As Margaret Thatcher said, “The trouble with socialism is that eventually you run out of other people’s money.” That’s where we are now. Hard working taxpayers have been big government’s Sugar Daddy for far too long, and now we’re out of sugar. We don’t want big government, we can’t afford it, and we are unwilling to pay for it. This debt ceiling debate is the perfect time to do what must be done. We must cut. Yes, I’m for a balanced budget amendment and for enforceable spending caps. But first and foremost we must cut spending, not “strike a deal” that allows politicians to raise more debt! See, Washington is addicted to OPM – Other People’s Money. And like any junkie, they will lie, steal, and cheat to fund their addiction. We must cut them off and cut government down to size. To paraphrase Hemmingway, people go broke slowly and then all at once. We’ve been slowly going broke for years, but now it’s happening all at once as the world’s capital markets are demanding action from us, yet Obama assumes we’ll just go borrow another cup of sugar from some increasingly impatient neighbor. We cannot knock on anyone’s door anymore. And we don’t have any time to wait for Washington to start behaving responsibly. We’ll be Greece before these D.C. politicians’ false promises are over. We must force government to live within its means, just as every business and household does. We can’t close our $1.5 trillion deficit overnight, but we must get as close as we can as soon as we can. Little nibbles here and there over 10 years (spun to sound like they’re huge budget cuts) aren’t anywhere near enough. I know from experience that cutting government spending isn’t easy. As governor, I made the largest veto cuts in my state’s history, and I didn’t make many friends doing it. But we will never recover, we will never get free of devastating debt, unless we make tough choices now. We don’t hear talk like this from leaders in D.C. or from those running for office because they say what they think we want to hear rather than what must be said. We are in desperate need of real leadership, but President Obama’s solution to everything is to grow government by borrowing more money, spending more money, printing more money, and taxing our job creators. He once said that he “believes in American Exceptionalism…just as the Greeks believe in Greek Exceptionalism.” Well, the path he has us on will make us just as “exceptional” as Greece – debt crisis, stagnation, permanent high unemployment, and all. As we approach 2012, there are important lessons we can learn from all of this. First, we should never entrust the White House to a far-left ideologue who has no appreciation or even understanding of the free market and limited government principles that made this country economically strong. Second, the office of the presidency is too important for on-the-job training. It requires a strong chief executive who has been entrusted with real authority in the past and has achieved a proven track record of positive measurable accomplishments. Leaders are expected to give good speeches, but leadership is so much more than oratory. Real leadership requires deeds even more than words. It means taking on the problems no one else wants to tackle. It means providing vision and guidance, inspiring people to action, bringing everyone to the table, and with a servant’s heart dedicating oneself to striking agreements that keep faith with our Constitution and with the ordinary citizens who entrusted you with power. It means bucking the status quo, fighting the corrupt powers that be, serving the common good, and leaving the country better than you found it. Most of us don’t see a lot of that real leadership in D.C., and it’s profoundly disappointing. But let me tell you where real hope lies. It’s not the hopey-changey stuff we heard about in 2008. Real hope comes from realizing how God has blessed our exceptional nation, and then doing something about it. We have been blessed with natural resources, hardworking entrepreneurs, and a Constitution that preserves the greatest form of government ever devised by man. If we develop those natural resources, allow our entrepreneurs to keep and invest more of what they earn, and adhere to the time-tested truths of our Constitution, we will prosper and endure. But first and foremost we must tackle our debt. We don’t have the luxury of playing politics as usual. We need real leaders who will put aside their own political self-interest to do what is right for the nation. And if they don’t emerge… well, America has a do-over in November 2012. If there is ever a time to show you have Governor Sarah Palin’s back, this is it. But please don’t delay, because the window of opportunity to be a part of this program will be open for a limited time only. To sign up as a volunteer member of “The Undefeated” Mobilization Team, click here. The Volunteering4Palin.com website is here. A list of the cities where “The Undefeated” will open this Friday, July 15 is here, along with the theaters, their addresses and links for tickets and showtimes. Visit “The Undefeated” website here. Follow the film on Facebook here and on Twitter here. Together, for Gov. Palin and with her, this is our chance to change the game. The community of bloggers supporting Gov. Palin is very much involved in this effort. Won’t you join us? On Thursday, Bristol Palin appeared on The View. Surprisingly the yentas over there were on their best behavior. Nice to see them treating Bristol with respect. Bristol is promoting her new book, Not Afraid of Life, a great read. An interesting update on ticket sales from the Highland Ranch, Colorado theater that is premiering The Undefeated next Friday. Ian Lazaran tweets: the percentages of pre-sales for The Undefeated and the new Harry Potter movie are running the same for the 15th. This shows a keen interest in folks who want to learn more about the real Sarah Palin vs the one made up by the lamestream media. The producers have released a new trailer for the move that samples some very powerful moments. Check it out here. The Undefeated is premiering in select theaters nationwide next Friday, July 15. To find the location nearest you, and order tickets, click here. Video Trailer From “The Undefeated”: Daughter.Wife. Mother.Warrior. Watching this preview brings a tear to my eyes. The kind of tears when you experience a championship win, or watch an inspiring movie. The kind of tears when you are inspired. This new teaser from the movie The Undefeated is just that powerful, and a small look at how the entire movie will effect you. In this clip you will see Tammy Bruce, Kate Obenshain, Sonnie Johnson, former Palin staffer Meg Stapleton, Mark Levin, and Andrew Breitbart. 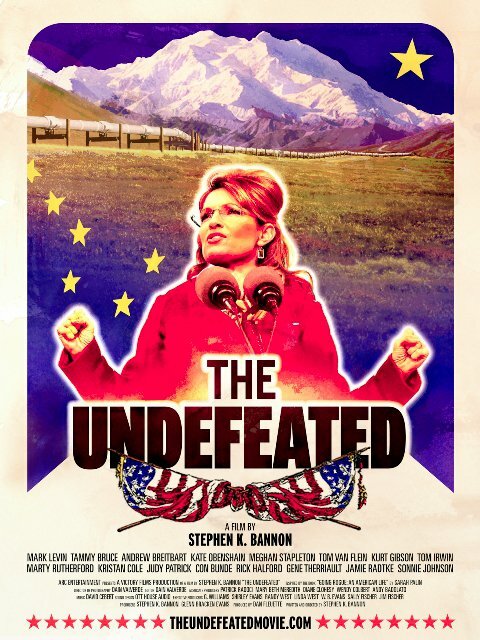 As you will see, the “warrior part of this segment in the movie has to do with how Sarah took on the highly corrupt Alaska Republican Party, including the self named Corrupt Bastards Club. [These Bastards proudly wore caps with “CBC emblazoned on them!] She also took on Big Oil and as Meg Stapleton has said, actually starred down a top oil executive in the airport once, when he told her she didn’t know who she was messing with! As we’ve said before, this is a must see film. If you are already a strong supporter of Sarah’s, this will only re-affirm why you support her in the first place. If you’re on the fence, this movie should change your mind. Even if you don’t care for Sarah, something tells me going to the movie may cure you of that. Sarah Palin is a woman of strong character and convictions. Someone who everyone should respect, even her foes. The much anticipated Sarah Palin documentary by filmmaker Steve Bannon comes out in theaters next Friday, July 15th. People can now see the trailer for the first time. I’ve now seen the film three times and one thing that stands out is how Sarah Palin has always been on the offensive and refuses to apologize for who she is. Subsequently, there are tens of millions of Americans who not only relate to her, but her ballsyness contrasts more with the Republican Party than the Democratic Party. If Sarah Palin doesn’t run for the Presidency, someone in the Republican Party should take note on what real leadership looks like. Democrats who watch this will see somebody they wish they had on their side—and they did once, in Alaska. Governor Palin stood up to the deservedly vilified ExxonMobil whose criminal misconduct with the Exxon Valdez was exacerbated with years and years of legal wrangling and deep-seated corruption that Governor Palin took on directly. Bannon’s movie is not a woe-is-her exercise in victimology; it’s a jarring look at how entrenched politicians and entrenched media can distort reality to maintain the status quo. I have built a brand and a mission based upon pointing out media distortion and lies. I have never seen a greater disparity between the media Sarah Palin and the real one. Mainstream media types who have seen this movie are admitting as much but claim that it’s Sarah Palin who drastically changed into a completely different person. No, this was a manufactured Palin, manufactured to destroy her in the pursuit of protecting Barack Obama. Rebels of all stripes who come to this film with open eyes will be inspired by a daughter, a wife, a mother, and a warrior who took on the system and won. I couldn’t agree with Andrew more. The Undefeated premiers in theaters nationwide on July 15. Click here to get tickets to a theater near you. This is not a movie you want to miss. Here’s an interesting story from Bowie County in Northeast Texas. It seems in June, County Clerk Natalie Nichols was out of town, and while she was gone, the Commissioner’s Court voted to wipe out any mention of the prayer and Pledge of Allegiance from its records. They did this on June 13, the day before National Flag Day. That didn’t sit well with Natalie. Though the motion had passed with a 3 to 1 vote approval, Nichols is being heralded as a GOP heroine for thumbing her nose at both the motion and the underlying threat potential of an ACLU lawsuit. The potential of a lawsuit was stated as the reason the motion was passed – and the purpose of not recording the actions in the meetings was in a hope to hide the official record that a small county Court Commission dared to say the Pledge and bow their heads in prayer before official business. Right before Nichols read her statement of refusal, Nichols says that the County Legal Adviser actually said, “She was seeking further legal action. “Nichols is undaunted by the threat of legal action and says that perhaps the ACLU can sue to prevent the prayer, prevent the Pledge and maybe she can be forced out of her position, but Nichols feels certain no one can sue her for doing her job until then – writing down what happens at the meetings. And if any commissioners want to object to the way she does her job, why then, Nichols says she’ll write their objections down as well. But the Pledge, the prayer, those go in and as long as she is there, those will stay in. Here’s an interview Nichols did when she was running for office. She says her political inspiration comes from Ronald Reagan and Sarah Palin. Listening to her speak, I remember reading Sarah Palin’s story. A PTA mom just wanting to make things better for her kids. As I listen to Natalie, I’m thinking we have a future GOP star. Sarah Palin is important to America for a multitude of reasons, but the fact she inspires so many others to step up and be heard may be one of the most important. Sarah Palin is a living reminder that in America, if you work hard, and use the talents God gave you, you can accomplish anything. As for Natalie, something tells me we are going to be hearing about her for years to come.